The School of Physics and Astronomy’s very own Dr Haley Gomez was invited to speak at this year’s incredibly popular TEDxCardiff. The event held at the Wales Millienium Centre in Cardiff was sold out within a minute! For more details see here. Dr Gomez works on using the most sensitive infrared cameras in space to reveal the origins of cosmic dust grains – the building blocks of life. 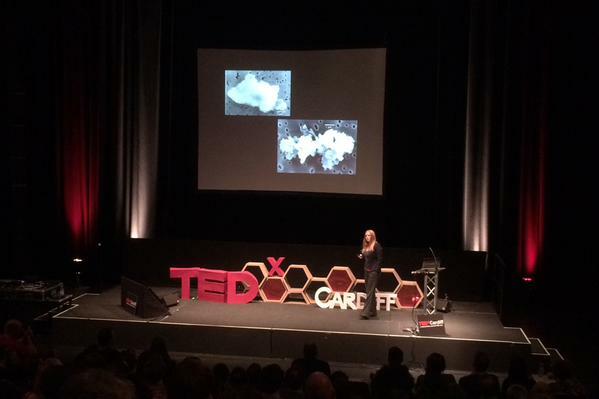 Her talk about using infrared telescopes to light up the dark will be available online soon. The image was taken by Huw James (@huwmjames).